Precision mechanical cutting is a common method of manufacturing piezoelectric micro devices. It uses a diamond cutter to cut a block of piezoelectric material or a thick film into micropillars and arrange them into an array for further assembly into a device. However, there are dimensional limitations in the processing of piezoelectric micro-devices by mechanical cutting, and it is difficult to process micro-column arrays of several tens of micrometers or less. At the same time, piezoelectric ceramics generally have low strength and poor toughness. These all bring more difficulty to mechanical cutting. 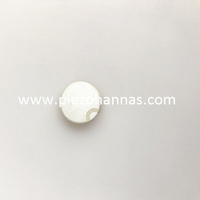 The mold forming process of piezoelectric discs pietzoelectric ceramics is a common method for preparing piezoelectric ceramic micro-pillar arrays and three-dimensional microelectronic devices, which can break through the dimensional limits of machining. The method comprises the steps of a Si plate, a polymer or an Al 2 O 3 film as a template, and combining the techniques of injection molding, electrochemical deposition, chemical vapor deposition, etc. It is to prepare a columnar structural material which is having the same pore diameter and uniform orientation. The processing technology is a micro-machining technology developed by the Energy Research Center in Germany with the synchrotron radiation X-ray source. It combines radiation etch, electroforming and micro-molding to produce micro-components such as plastics, metals and ceramics. The depth-to-width ratio of processing can be up to 200 times, which is an ideal way to prepare piezoelectric ceramic actuators. PZT columns with a diameter of 25 mm and a height of 250 mm have been prepared, but there are problems such as collapse and non-compactness of the PZT column during the sintering process. In addition, the equipment is required for technology is expensive and is not conducive to large-scale promotion. The silicon mold process combines the micro-machining technology and material forming technology of silicon wafers. The micro-machined silicon wafer can be used as a mold to break through the micro-machining limit of the diamond blade cutting method, and the PZT column can be made by in-mold hot isostatic pressing. The sintering is dense and maintains a neat arrangement. The process of the silicon mold process is a layer of photosensitive glue which is coated on the surface of the silicon wafer by a homogenizing machine, and then placed under the mask for exposure, and after development, a pre-design is formed on the photosensitive layer. Good pattern. The photosensitive silicon wafer is subjected to reactive ion etching, and the portion not protected by the photoresist is etched into micropores. After the mold is prepared, the slurry of the PZT powder (containing the binder) is poured thereon, dried, degreased, vacuum-sealed into the glass envelope, and subjected to hot isostatic pressing. Finally, the silicon mode is selectively etched away using a special gas (XeF2) to obtain a PZT microcolumn array. After the PZT microcolumn array is obtained, a suitable polymer is cast thereon and the bubbles are removed by vacuuming. After curing, the two sides of the vertical PZT piezo cylinder tube transducers are ground until the PZT pillars buried in the polymer expose both end faces. Next, the metal film is vapor-deposited on both sides of the composite according to the designed pattern, and then the PZT is polarized to obtain a dense and ordered piezoelectric ceramic driver array. A dense array of piezo ceramic was obtained by this method. The microcolumns were 90 m height, 7 m in side length, and up to 12 in aspect ratio. More than 20,000 PZT microcolumns obtained in the experiment did not find deformation, damage or collapse of one PZT microcolumn. Although the ideal micropillar array can be obtained by the silicon mold process, the process is complicated and the energy consumption of the preparation process is large. Compared with this, electrophoretic deposition has the advantages of simplicity, convenience, low cost, and recycling of raw materials. The micropillar array and PZT thick film is prepared by electrophoretic deposition process . Based on the research of the two, which summarizes the process flow of electrophoretic deposition to prepare PZT microcolumn array. 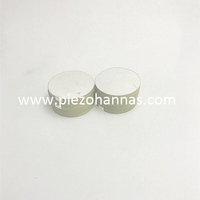 First, a certain concentration of Pzt piezoceramic cylinder tube is prepared, and concentrated HCl is added as a dispersing agent to adsorb H+ on the surface of the particles, thereby suspending the particles. Graphite was used as the positive and negative electrodes, and a Pt-plated plated Pt was used as the substrate, which was prepared by reactive ion etching. The Pt-plated silicon wafer is connected to the negative electrode by a conductive adhesive to ensure the potential of the substrate and the electrode, thereby realizing electrophoretic deposition, and the PZT powder with H+ is deposited into the micropores on the silicon wafer. After low temperature activation sintering, a dense array of microcolumns can be obtained. 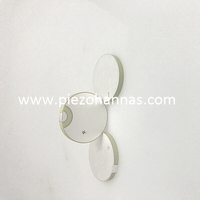 Then, using the same plating electrode, polarization and other post-processing as the silicon mold process, a piezoelectric ceramic driver array with excellent performance and dense alignment is obtained. The moldless molding process, the precision mechanical cutting method and the LIGA processing technology are difficult to meet the process requirements for preparing the piezoelectric ceramic actuator microcolumn array. 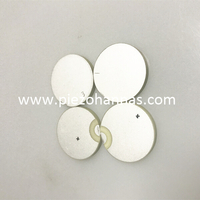 The silicon mold process and the electrophoretic deposition process show great advantages, it is not only break through the size limitation, but also obtain excellent performance and neatly arranged micro-column arrays, which is very suitable for preparing piezoelectric ceramic driver arrays for displays.